Supergram Pro Messenger is Super Advanced messaging app. 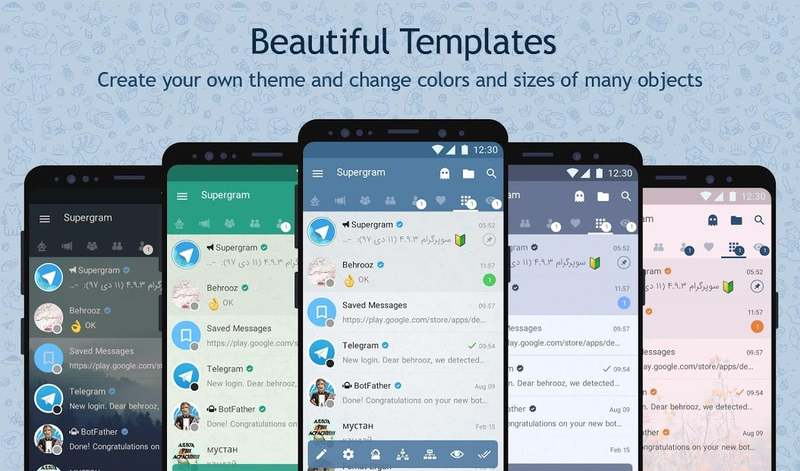 This version of Supergram (Pro) has not any ADS with more features. 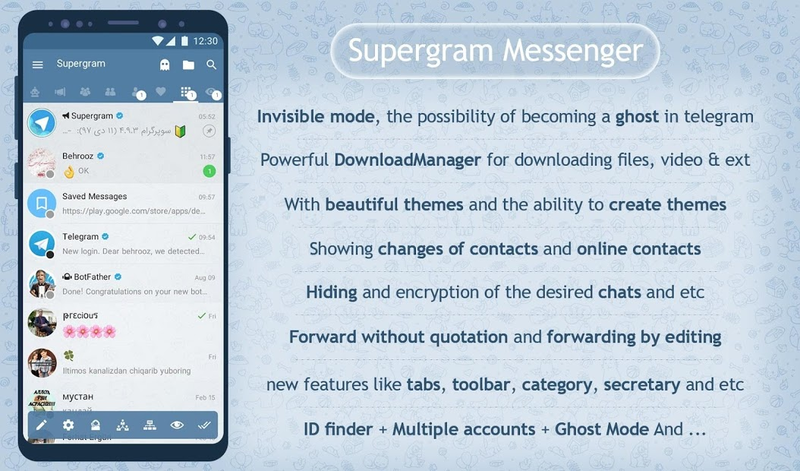 Supergram Messenger is one of the fastest and lightest, unofficial messaging app that uses Telegram's API. 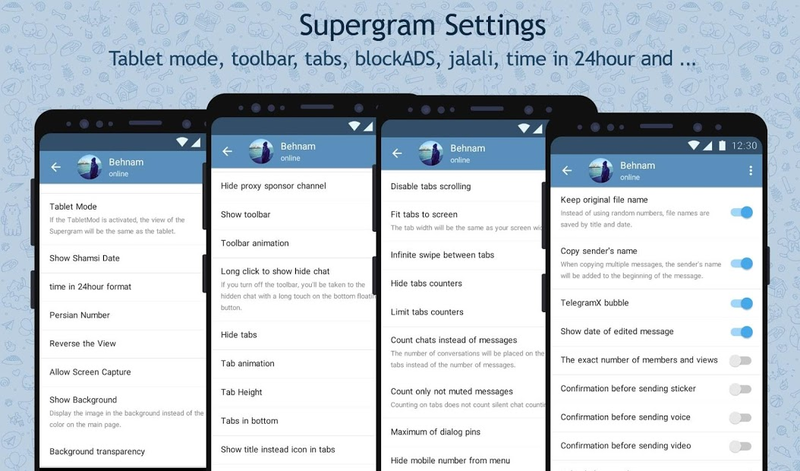 For those interested in maximum privacy, Supergram is best choice. - Download Manager: manage downloads in an advanced way at arbitrary time schedule. Downloads will start at the specified time. - Advanced specific audience: be aware of being online and offline, change of photo and the name and phone number of the intended audience in the shortest time possible. - Categorizing Chats: Categorize your chats in your customized way. - Managing media and files: View and manage all media files at once. - Advanced forward: Changing text before sending, changing or adding the text under image or before sending a photo or video, adding text to Gif before sending, all with advanced forward. - Separation of Posts: groups, channels, bots and contacts are placed in isolated tabs. 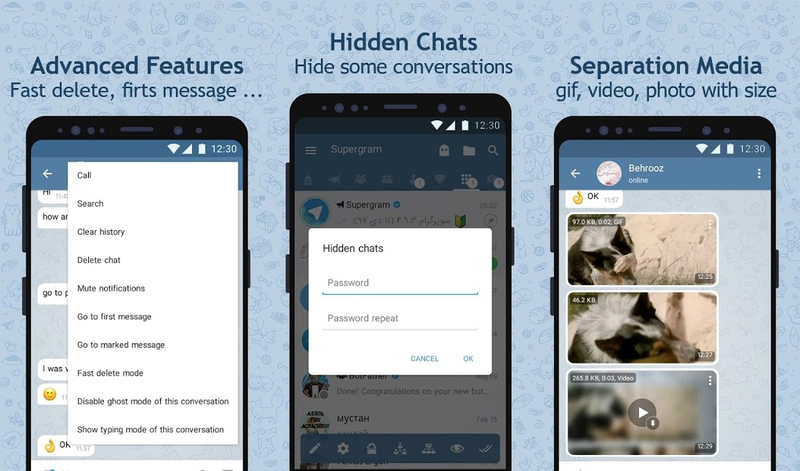 - Hiding channels, groups: the possibility to hide chats in an advanced form and the ability to set a password for the hidden chats as numbers or text. - Favorites and unread tabs: Always important conversations are within your reach in separate tabs. The ability for automatic download of the favorites chats. - Selecting of stickers and Emoji: Adding favorites tab to display stickers and Emoji. - Viewing the status of visitors’ audience in the Home: the Status of the last Visitors audience is displayed with a colored icon. 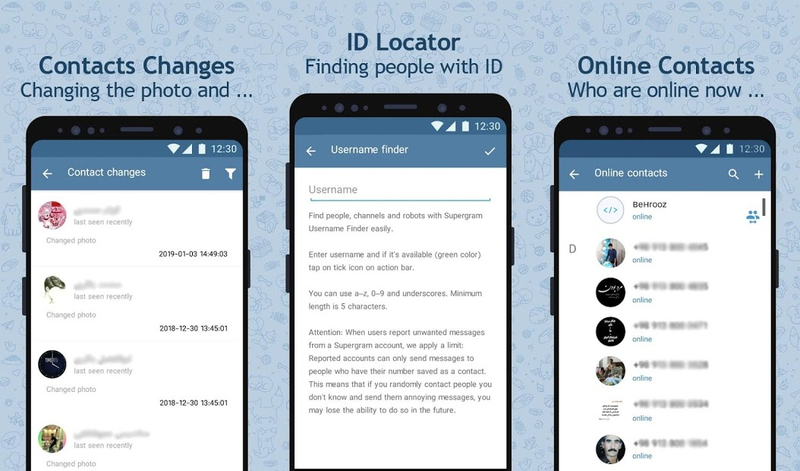 - ID locator: Using this feature, you can search and find friends through their ID. - Forward without the quotes: You can display other messages without being called signaling and sending it to others. - Changes of Contacts: report on the latest changes of contacts in the name, number or profile picture. - The possibility to create a theme: You can use our built-in templates and in addition, you will be able to create your own themes and share it. - Delete contacts: You can delete contacts in groups and selectively. - Changing the font: the ability to change and choose a font from among beautiful fonts combination. - Online contacts: View online contacts list. - Separation of bilateral contacts: Contacts whose numbers you have appeared distinct.